Materials used: Stamps – Cuteasauraus, Eco Friendly, Summer Groves (Paper Smooches); Cardstock – American Crafts; Distress Inks, Distress Markers; Glossy Accents (Ranger) and Wink of Stella. I’ve a couple more ideas for this sketch – looking through windows at scenes as well as a couple of streetscapes so, depending on how things go, I might try and create a couple more cards. It’s just such a great sketch. I think it could easily become a go-to design. Oh, I also made another card based on this sketch (in fact, I made it before the one I am submitting for the challenge) but I thought it might be a bit busy. Materials used: Stamps – Cuteasauraus, Eco Friendly (Paper Smooches); Cardstock – American Crafts; Distress Inks, Distress Markers; Glossy Accents (Ranger) and Wink of Stella. Queen of the Scene, my dear Kylie – and these two are yet more evidence of your incredible talent at creating scenes that are beyond awesome! Not only is the T-Rex lumbering through the trees totally darling (T-Rex and darling…hmmmm), but the pattern of eggs/bones is such a special touch! Seriously, the PS people need you on their team, because you know how to work their stamps to the max! Again, your colouring has me, as Darnell would say, aswooin with its spectacularness!! Wow x a zillion! I grinned like a cheshire cat when I read your comment, C – Queen of the Scene – love it. Thank you so much! Your kindness makes my day. 🙂 hugs! 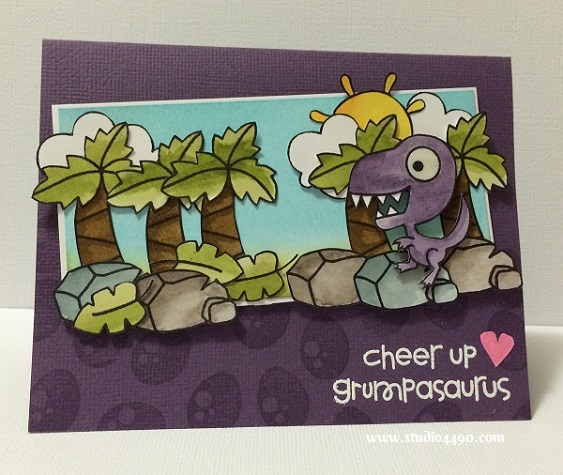 Oh my goodness….these two adorable scenes you’ve created are beyond fabulous! Wow! 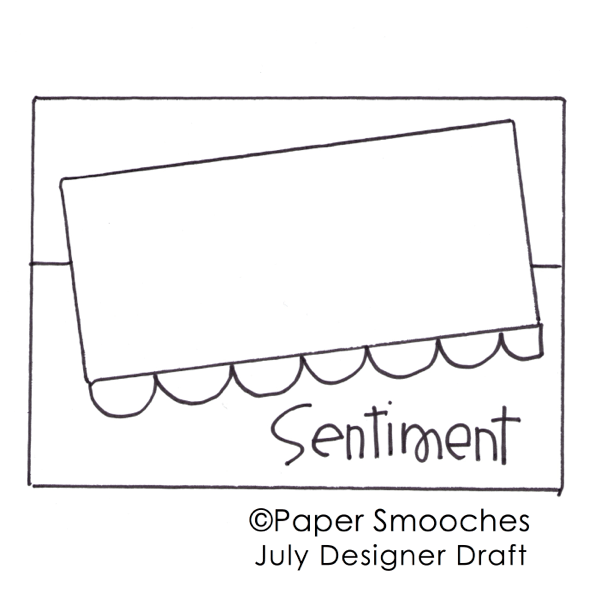 Thanks so much for playing with us at PaperSmooches Sparks! Sooo cute, Kylie! After looking at your sweet scene, I noticed the green cardstock all stamped up with eggs and bones. That’s a great detail. The little pink heart and bird are great color balancers too. I think I need to steal one of Geri G.’s sayings…”winner, winner, chicken dinner!! !” Score big time with this card, Kylie. LOVE it!! Have an amazing weekend, and I’m hoping for more creations by you popping up in my right side bar!! Thank you my dear friend! 🙂 I’m always buoyed by your enthusiasm and confidence in my card. 🙂 Hope you have an amazing weekend too. 🙂 Thank you! Hugs! Wow! A lot of work went into this card and it turned out SO cute!! Love it! Ooh, this is such a unique take on the sketch! 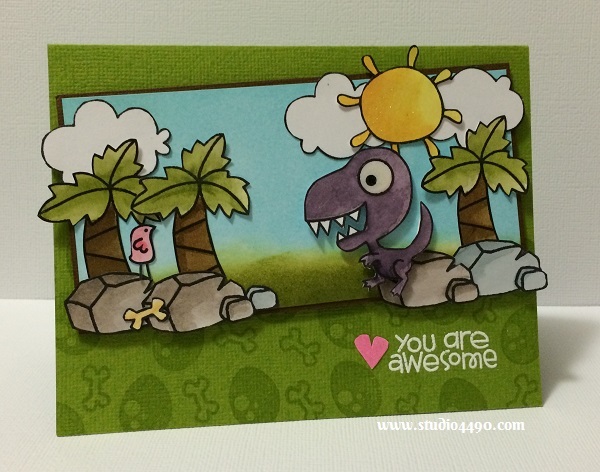 You *really* rocked this one, and the cute dino was the perfect stamp to use. I just love how he’s sitting on that rock in the green card. I can almost imagine him drinking a cup of tea (weird, I know, but my mind gets kind of odd sometimes lol).